Q: I'm wondering about the prepaid plans versus just buying a minutes card. I think with the prepaid plans like for the AT&T gophone or any other carrier, they will charge taxes and fees over and above the plan rate. So, for example, if you buy a $30/month no contract plan they will also charge the taxes and fees, correct? 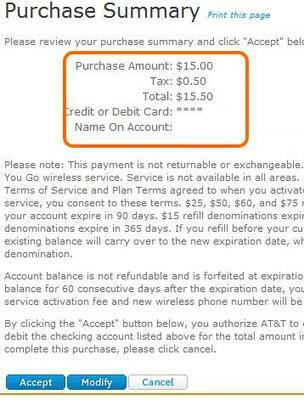 I have the $65/month contract plan with AT&T and my actual bill is $84/month which includes taxes/fees. This is outrageous, imo, so I don't think we are really saving all that month UNLESS we buy just the cards. I just wanted to clarify this. Is this correct? My (edited) answer: Wow, that's a lot of taxes and fees! There are a few taxes and fees involved when you buy airtime with most prepaid plans. They are usually just a couple of dollars more, though it does depend on the state. Here are a few examples. I bought $15 of airtime on a GoPhone plan a while back for a phone I was testing, and the total charge for the airtime was $15.50 which is only about 3 percent tax. This is in Virginia. You can join the plan either by buying a GoPhone handset or getting a SIM card for your existing phone. So for a GoPhone plan the additional taxes and fees are fairly minimal. This may not be the case for a no-contract post-paid plan where you get a bill every month. In that case, I suspect the additional taxes and fees may be higher. Similarly a $45 Straight Talk airtime card cost about $47 which is about 4 percent. $20 of Tracfone airtime cost me $20.83 and so on. I remember that the taxes were a little higher in North Carolina - closer to the usual sales tax of 6 or 7 percent. So, again, there are some state taxes. However, in general, your out-of-pocket costs should not be too bad. Some companies include the taxes and fees in their airtime card cost so that there are no extra charges. For example, I recently purchased $10 of PTel airtime online and was charged exactly $10. Comments for Any Additional Taxes and Fees for Airtime Purchases? Additonal Taxes and Fees for Airtime Purchases. In the last year or so I have noticed that an additional $.50 will be added for taxes and fees directly after the subtotal for a Net10 $30 airtime card. I think the description next to the charge says something about 911 fee. So far I have only noticed this additional charge when I have purchased the $30 airtime cards that will add up and rollover. I have not noticed this charge when I purchase the Net10 $40 monthly plan cards. I also purchase my airtime cards from the same store each month. So I do not know if this charge is applied from other stores or not. Paying an additional $.50 for a 911 fee is not an unreasonable amount in my eyes.